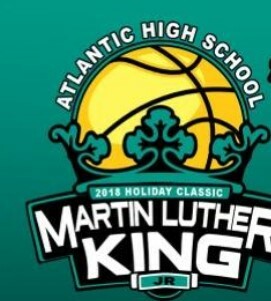 We spent MLK Day in the Port Orange Atlantic gym watching their version of the Holiday Classic. Some of the more noteworthy performers are higlighted below. Already ticketed to the Big Ten and Michigan, it was still good to see 6’10 Collin Castleton of Father Lopez and check in on his development. Boyd Anderson did a good job of keeping him in check in getting a near-thirty point win using a collapsing zone to surround Castleton. Still, he managed 20 points, 9 rebounds, and 5 blocks. His improvement at the defensive end has become noteworthy, as he gets by more on timing than length or leaping ability when it comes to protecting the basket. Offensively he’s better facing the basket than posting up but as he gets stronger and more athletic with age, Castleton should become an inside/outside threat for the Wolverines. A key component to Boyd Anderson’s win was the play of senior guard Dwayne Adams. The 5’11 guard has a scorer’s mentality, exceptional speed and quickness with the ball, and plays with a chip on his shoulder. He finished with 19 points and 4 assists in the contest, going 3-6 from behind the arc in the process. Adams continually pushed the pace when given the opportunity and made good decisions with the ball when on the move. His points came from all three levels but at sub-six feet scoring at the basket was a bit of a challenge. Defensively he anticipates well and has quick feet and good instincts. We saw Lyman’s 6’1 senior guard Tyrese Porter over the holiday break and Monday’s game essentially confirmed what we saw from him a few short weeks ago. A stongly built wing, Porter is more of a scorer than shooter as he excels when out in transition or attacking the rim off the dribble. When given open looks and time from beyond the arc he can make those shots at a reasonable rate. He tallied 21 points and 4 rebounds in Monday’s game. Porter has the upper-body strength to defende bigger players should he be forced to battle inside. Arguably one of the top shooters in the state’s Class of 2018, New Smyrna Beach’s 6’6 Nick Heard put that skill to good use in the team’s win over Hagerty of Oviedo. The lefty had a game high 23 points, going 3-5 from beyond the arc and 10-13 from the free throw line. However, don’t let the number of free throws fool you into thinking that Heard spends much time attacking the basket. His shots come primarliy off the catch or in transition and if New Smyrna Beach is ahead and knows the opponent needs to foul, the ball goes into Heard’s hands early and often. Heard gets his shot off quickly and seems unfazed as defenders attempt to close out on him. He’s adequate in the other areas of the game but its his touch from deep that will allow him to play at the next level. Believe it or not, Monday was our first chance to see Naseem Khallid play in a high school setting. The 5’11 sophomore guard out of Jacksonville First Coast is one of the top players in the state’s 2020 Class and he did nothing Monday evening to change that perception. Finishing with 19 points, 9 rebounds, 3 asssits and 3 steals, it is clear that Khallid is key to the success of First Coast. He’s not only crafty with the ball but he rarely loses control of his dribble in a crowd. Khallid seemingly got to the rim anytime he wished but took some tough shots in hoping to draw foul; all too often he didn’t. As First Coast was attempting to make a late comeback, he shot a few threes that were rushed and a bit too deep. Still, those are issues that will certainly be overcome with experience. Khallid gets to the line a lot and has improved his success rate there; he was 8-10 against Atlantic. An emerging player in the 2020 Class is Atlantic’s 5’10 guard Jalen Speer. In the win over First Coast on Monday, he had a game-high 26 points, 16 coming from the foul line, going 16-20 in the process. He drew several fouls when driving the lane and breaking down the defense and was money late in the game as Atlantic was protecting its lead. Improving his success rate with his jump shot from the perimeter is his next order of business. As it stands now he does a good job of creating tempo and tenaciously defends his position.